Trump has promised Americans “huge” tax cuts, but only 44 percent of taxpayers would see their tax bills reduced by more than $500 in 2019, according to JCT's analysis of the winners and losers in the plan. The chart below was first reported by The Washington Post after a GOP senator's office shared it. “We're going to give the American people a huge tax cut for Christmas — hopefully that will be a great, big, beautiful Christmas present,” the president said last week. Overall, the majority of Americans -- 62 percent -- would get a tax cut of at least $100 in 2019, according to JCT. The remaining 38 percent would either pay about the same in taxes as they do now or get a tax hike. But by 2027, just 16 percent of Americans would get a tax cut of at least $100. The "winners" fall dramatically because the tax cuts for individuals go away in 2026 in the Senate GOP plan. Republicans argue that those tax cuts are likely to be extended by a future Congress. The Reagan plan, though, was far more popular in 1981 than the current Republican plan is now. In a Gallup survey taken in the days after Reagan signed his tax cuts into law on Aug. 13, 1981, 51 percent of Americans were in favor of it. Just 26 percent of Americans were opposed. The other major tax cut of the Reagan administration (signed in 1986) wasn’t nearly as popular, but it was still more popular than the current GOP legislation. A CBS News/New York Times survey conducted in the days after the bill passed Congress found 38 percent in favor and 34 percent opposed. During the campaign, Trump retweeted neo-Nazis. He's at it again. U.S. President Donald Trump retweeted three anti-Muslim videos purportedly showing violence by Muslim migrants. The videos were originally posted by Jayda Fransen, the deputy leader of the Britain first movement. Britain first is a far-right ultranationalism group which purports to document Muslim activity across Britain and Europe. The group formed in 2011 as an offshoot of the far-right, fascist party - British National Party. The group's founder Paul Golding is a convicted felon and was reportedly previously a member of the neo-Nazi National Front. The information-sharing deal between President Donald Trump’s legal team and that of former national security adviser Mike Flynn has been a “scandal,” as well “ethically dubious” and could be construed as form of “witness tampering,” according to a top legal expert. University of New Hampshire professor and attorney Seth Abramson shared his opinions in a 30-tweet thread posted Thursday night on a possibly nefarious deal between the two legal camps and provided greater insight and context into what he believes has gone on. The off-year election results also point to a wave. It was a foregone conclusion that Democrats would pick up the governorship of New Jersey, but state legislative gains in Virginia, Georgia, Washington, and elsewhere are ominous for Republicans. Tim Storey, the elections guru at the National Conference of State Legislatures, says that about 33 state legislative seats have shifted from Republican to Democrat this year, while just two have gone from Democrat to Republican, and a couple of seats could go either way. In special congressional elections, in strongly GOP districts in Georgia, Kansas, Montana, and South Carolina, Republicans have come out on top, but voting patterns showed them underperforming the norm by 6 to 12 points. These results do not bode well for the 23 GOP-held districts won last year by Hillary Clinton or for those that Trump won narrowly. Taxpayers in Democratic-leaning states: To fund other tax cuts, the House and Senate plans rely heavily on retrenching the deduction taxpayers can now take for state and local taxes, known as SALT. Of the 20 states where the highest percentage of taxpayers take that deduction, Hillary Clinton won 16 last year. Donald Trump, meanwhile, won 26 of the 30 states where the smallest percentage of taxpayers use the SALT deduction. In that way, the bill forces blue-state families to fund tax cuts for their red-state counterparts. Homeowners in big-city markets: The impact of the SALT changes is magnified by the House bill’s provision halving the maximum mortgage-interest deduction to $500,000. In most markets, this affects few taxpayers since few home prices exceed that threshold. But data from ATTOM Data Solutions, which tracks property information, show that provision could hurt one-fifth or more of homebuyers in the most expensive markets around major cities, particularly along the coasts—places like Seattle, Southern California, Silicon Valley and the San Francisco Bay area, Northern Virginia, and the New York City metropolitan area. All those places, like most large metropolitan centers, gave Clinton commanding margins. Between the mortgage and SALT limits, the bills hit many upper-middle-class taxpayers, especially in blue states. The Institute on Taxation and Economic Policy calculates that by 2027 the Senate bill would raise taxes on about 45 percent of households between the 80th and 95th income percentiles in California, Virginia, New Jersey, and New York; and over one-third of such families in Oregon, Minnesota, and Illinois. Many of those families are precisely the white-collar suburbanites who have long resisted Trump. In all, ITEP has calculated that by 2027 taxpayers in New York, New Jersey, Maryland, and California—which Clinton won— would pay nearly $17 billion more in federal income taxes. At the same time, those in Texas and Florida—which backed Trump—would pay over $31 billion less. “You can definitely see the ideological tilt here,” Carl Davis, IRET’s research director, told me. In Defying the Odds, we discuss congressional elections as well as the presidential race. In Alabama, Doug Jones -- former prosecutor of the KKK faces off against accused child molester Roy Moore. First, read his book. In it, Moore describes how he met his wife at a Christmas party hosted by friends. He would have been 37. She was 23. "Many years before, I had attended a dance recital at Gadsden State Junior College,"
Moore wrote. "I remembered one of the special dances performed by a young woman whose first and last names began with the letter 'K.' It was something I had never forgotten. Could that young woman have been Kayla Kisor?" Moore later determined that it was. "Long afterward, I would learn that Kayla had, in fact, performed a special dance routine at Gadsden State years before," he wrote. Take a second to think about what's being said here. Moore first took notice of Kayla at a dance recital? Perhaps you're wondering what "many years" means, and I wondered that too. Luckily, Moore again has cleared that up for us. In an interview Moore gave earlier this year, he gave a similar account, but for one detail. "It was, oh gosh, eight years later, or something, I met her," Moore said. "And when she told me her name, I remembered 'K. K.,' and I said, 'Haven't I met you before?'" It's a simple matter of subtraction. When Roy Moore first took notice of Kayla she would have been as young as 15. There's a little fuzziness, to be sure, in the timeline. There's the "or something" Moore fudges with in the interview. Eight years before could have been slightly too early to put Moore in Gadsden, he started work as an deputy district attorney there in 1977. So maybe she was 15, or maybe she was 16. But still, here is a grown man at about 30 years old attending a girls' dance recital, and doing what exactly? A senior Russian official who claimed to be acting at the behest of President Vladimir V. Putin of Russia tried in May 2016 to arrange a meeting between Mr. Putin and Donald J. Trump, according to several people familiar with the matter. The news of this reached the Trump campaign in a very circuitous way. An advocate for Christian causes emailed campaign aides saying that Alexander Torshin, the deputy governor of the Russian central bank who has been linked both to Russia’s security services and organized crime, had proposed a meeting between Mr. Putin and Mr. Trump. The subject line of the email, turned over to Senate investigators, read, “Russian backdoor overture and dinner invite,” according to one person who has seen the message. The proposal made its way to the senior levels of the Trump campaign before Jared Kushner, the president’s son-in-law and a top campaign aide, sent a message to top campaign officials rejecting it, according to two people who have seen Mr. Kushner’s message. In all of this, there is a spectacular accumulation of lies. Lies on disclosure forms. Lies at confirmation hearings. Lies on Twitter. Lies in the White House briefing room. Lies to the FBI. Self-protective lies by the attorney general. Blocking and tackling lies by Vice President Pence. This is, with a few exceptions, a group of people for whom truth, political honor, ethics and integrity mean nothing. Republicans will tell your they support Moore and Trump as vehicles to policy goals. That assumes (falsely) that their policy goals are noble when they are actually unrealistic, unpopular, inconsistent and unconservative. Run up the debt, say the fiscal hawks. Take away health-care coverage, say the GOP “reformers.” Ban Muslims, round up Dreamers and slash legal immigration say the “Constitutional conservatives” and “market capitalists.” Worst of all: Vote for “values,” say the charlatans who backed Trump. In truth, the goals these Republicans care about, if they ever did, have long ago been sublimated (they certainly changed them entirely) to the goal of holding power, of winning. When that is the highest calling they’ll vote for alleged child predators, racists and just about anyone else with an “R” next to his or her name. The result is moral haos, political malfeasance and gross incompetence. And a President Trump. A search of TideFans.com reveals that BamainBoston often opined on controversial issues, including race, abortion, perceived federal overreach, and Southern heritage. In one post from February 2011, he defended the honor of the early Ku Klux Klan. At a rally for accused child molester Roy Moore, homeschooler Jennifer Case (at about 12:40 in the video) said: "He is the closest thing that any of us have observed to a founding father in our times. DeTocqueville said: `America is great because she is good. If she ever ceases to be good, she will cease to be great.'" Tocqueville said no such thing. This quotation is fake. As I have been pointing out for 22 years, Tocqueville never wrote any such thing. Many politicians -- including Bill Clinton and Ben Carson -- have used the fake quotation. Hillary Clinton alluded to it in her acceptance speech. In Defying the Odds, we discuss Trump's character..
Trump is sidestepping the Roy Moore story. He has good reason, given photos, videos, and stories involving Trump and minors. 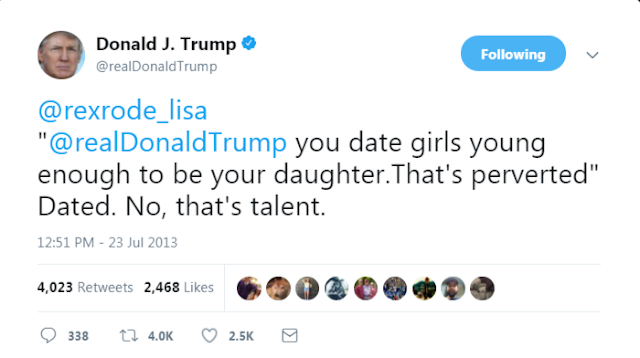 Donald Trump has said a lot of horrific things about adult women in the past year. But in a video unearthed by CBS News, Trump is seen targeting a different kind of victim: a young child. In the 1992 video, Trump, who was 46 at the time, can be heard talking to a little girl, asking her if she’s going to go up an escalator. After she says she is, Trump turns to the camera and says, "I am going to be dating her in 10 years. Can you believe it?" In a normal Republican administration, an allegation that Senator Al Franken, a Democrat, had groped a woman as she slept, accompanied by a damning photo, would be a political gift to the White House. When its occupant is Donald Trump, however, the story is altogether different—late in his presidential campaign, Trump was faced with accusations of sexual misconduct and assault from more than 16 women, which many believed would spell his political doom. Trump and his ilk have vigorously denied the allegations, with press secretary Sarah Huckabee Sanders recently declaring from the podium that all of the president’s accusers are liars. But they’ve resurfaced in the wake of the Roy Moore scandal, which has left both Trump and the Republican Party metaphorically handcuffed to a Senate candidate accused of child molestation. Neither measure of hypocrisy seems to weigh on Trump, however, who gleefully ripped Franken Thursday night on Twitter. Most American voters — 52 percent — disapprove of the GOP proposals to overhaul the tax system, according to a Quinnipiac University poll released Wednesday. Only 25 percent of respondents approve of the Republican effort. The GOP says its push to chop taxes on businesses and individuals by year-end is designed to trim the burden on middle-class taxpayers while boosting job creation and wage growth. Voters largely have not bought into the message, the Quinnipiac poll found. Sixty-one percent of voters said the plan would mainly help the wealthy. Twenty-four percent responded that it would primarily benefit the middle class, while only 6 percent said the same about low-income people. The proposals favor the rich at the expense of the middle class, 59 percent of respondents said. Only 33 percent disagreed with that statement. Only 36 percent of respondents said the GOP effort will lead to more jobs and better economic growth. A majority, 52 percent, disagreed. Thirty-six percent of voters said the proposals would not have much of an effect on their taxes. Thirty-five percent said the plan would increase what they pay, while 16 percent said it would reduce their tax burden. In a national survey of 9,504 adults conducted for The New York Times by the online polling firm SurveyMonkey, 78 percent of respondents said they did not believe they would receive a raise if their employer received a tax cut. Even many Republicans doubted they would benefit directly from a corporate tax cut: Roughly 70 percent of self-identified Republicans — and roughly 65 percent of people who said they strongly approved of President Trump’s performance in office — said they didn’t think they would get a pay increase. But the bill’s cuts in personal tax rates, its increase in the standard deduction and other benefits for individual taxpayers are partially offset by reductions in some popular tax deductions — including those for state and local taxes and mortgage interest payments, many of whose beneficiaries live in states with high income or sales taxes and high property values. As a result, according to a new analysis by the left-leaning Institute on Taxation and Economic Policy, the House bill would force taxpayers in California, New York, New Jersey and Maryland to pay $16.7 billion more in personal income taxes in 2027 than they would under current law, while taxpayers in the other 46 states would pay $101.5 billion less. More than one-third of the cuts would flow to Texas and Florida. California would be the hardest hit of all, with its taxpayers kicking a cumulative $12.1 billion in additional taxes into the federal kitty in 2027, the institute’s analysis found. But it’s not just the higher taxes that will hurt — the lower caps on the deductions for property taxes and mortgage interest likely would have an immediate, chilling effect on property values across the state. That’s good news for first-time homebuyers, bad news for millions of others who already own homes in this costly market. Fox News anchor Shep Smith broke from his network’s hyperventilating coverage of the “Uranium One” pseudoscandal to debunk allegations of wrongdoings by Hillary Clinton. Smith, never one to blindly toe the party line, took to task President Donald Trump ― and, implicitly, his cable news network of choice ― over the “inaccurate” portrayal of the sale of a Canadian mining company with major U.S. holdings to a Russian company. It’s a claim that has dominated Fox News in recent weeks after The Hill published a deeply flawed report about a “Russian bribery plot” involving the sale. Following pressure from the president and several Republican members of Congress, Attorney General Jeff Sessions announced earlier this week that the Justice Department would consider appointing a special counsel to review the deal as well as other matters involving Clinton and other Democrats. 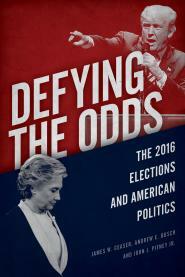 In Defying the Odds, we discuss problems that brought down the Democrats. Another is the party gerontocracy: Feinstein, Pelosi, and Sanders, among others. Senate Majority Leader Mitch McConnell (R-Ky.) said Monday that Republican nominee Roy Moore should end his Senate campaign in Alabama, following allegations that he initiated a sexual encounter with a 14-year-old girl when he was 32. “I think he should step aside,” McConnell said. His comments marked the most definitive position he has taken on Moore’s candidacy since The Washington Post reported the allegations on Thursday. Although it is too late to remove Moore’s name from the ballot before the Dec. 12 special election, McConnell said he is exploring the option of a write-in campaign by Sen. Luther Strange, whom Moore defeated in the primary, or another Republican. The Post reported Thursday that Leigh Corfman alleged that Moore initiated a sexual encounter with her when she was 14 and Moore was a 32-year-old assistant district attorney. Moore has denied the allegations and has vowed to continue his campaign.